I know many people will be horrified at the "rigidness" of some of these ideas, but as a single mama of three children, a 17 year old, a 25 month old and a 21 month old I believe adding these to our family's rhythm will make things much simpler and allow us to focus our energy on more creative and productive outlets than what to make for meals and what to wear. I also hope it will add a little more certainty to my children's lives that things are cycular, they come and go and come again. Using the correspondences for the days of the week found in many Waldorf books, honestly I am not sure who created these correspondences I do know I was familiar with them before I became interested in Steiner, I believe they are fairly ancient to humankind and Steiner adapted them to some of his philosophies. I have seen them in Greco-Roman texts. However as a Waldorf family we will just use the chart found in "The Waldorf Kindergarten Snack Book" for our daily grains and this chart for our colors (it also contains the grains and many other correspondences such as Steiner's biodynamic preparations). For colors of the week I am creating outfits that correspond to the daily colors for myself and the littles, honestly they wear natural colored woolies most of the winter so I just need to knit them vests, or overdresses to wear on top. My hope is this will eliminate trying to pick out clothing in the morning, we all will know its Monday, is baking day and purple day! 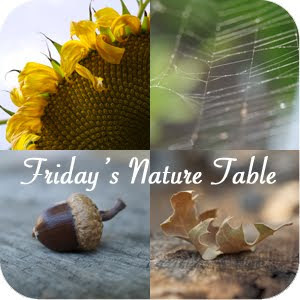 I also will try to highlight things in are home of that color to help them recognize what day it is, simple things as using purple napkins on Monday or creating a centerpiece at the table with a collection of their purple toys. Kiera washing dishes at school on "Red Day"
Pears waiting to be baked. So far it has been much easier having parameters to work with, I know I have to use this certain grain, and I have the food from the farmshare to use (I do add things that I can't buy from local farmers but I try to make the bulk of our food from our local farms). We are only a few days into this experiment but so far I am really enjoying the ease of it. Rudolph Steiner I do believe you were a genius! Shared on Our Seasons of Joy's Waldorf Wednesday's. I definitely agree that having these things in place makes our days easier. If nothing else, it's one less decision that we have to make! 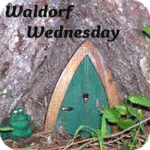 Thanks for linking up on Waldorf Wednesday. I hope we'll see you back this week! Feel free to add multiple links since we were off last week.